Well, I’m finally back…and it’s good to be getting back to normal. Thank you so much for your thoughts and prayers after my surgery! This is a very simple recipe, but one you’ll have to try. My mother-in-law makes the best caramel corn around and she made it when we went to visit over Spring Break. This stuff is so addictive! It’s caramelly, crunchy and hardly lasts long enough to store, in fact, when she’s making it, it gets gobbled up so fast you have to hurry to the kitchen to get your share or you’ll miss out! popped corn, while it’s still warm. Turn out onto waxed paper. Stir well to coat, then microwave popcorn mixture on high for 1 minute; stir. Microwave 1 more minute, then stir again. 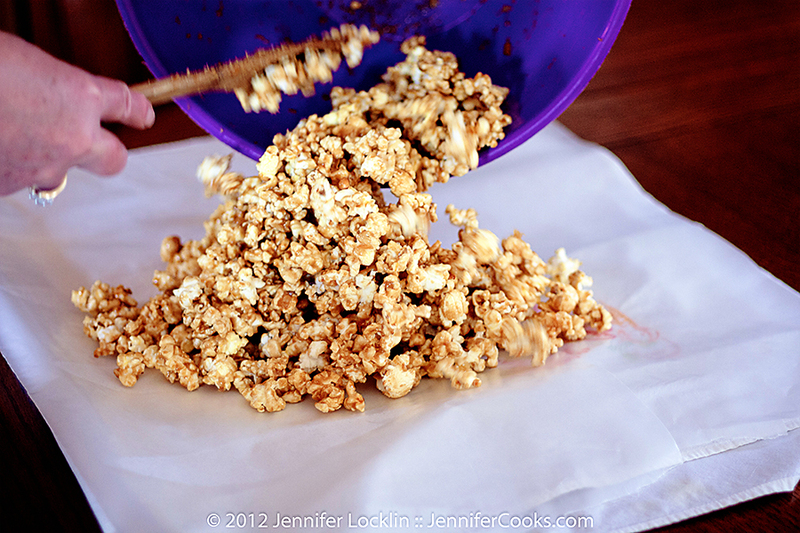 Pour immediately over popped corn. Add baking soda and vanilla; stir well (this will bubble up). Combine sugar, butter, syrup and salt and microwave on high for 1 1/2 minutes; stir. Microwave 1 minute more; stir. Start with fresh popped corn and pour it into a large microwave safe bowl. Place popped corn into a 4 to 6 quart (large) microwave safe bowl; set aside. In a separate microwave safe measuring cup or bowl, combine brown sugar, butter, syrup and salt. Microwave on high for 1 ½ minutes; stir. Microwave on high again for 1 minute more; stir. Add baking soda and vanilla; stir well (will bubble up). Immediately pour this mixture over popcorn, stirring to coat evenly. Microwave coated popcorn mixture for 1 minute on high; stir. Microwave 1 more minute on high and stir well. Turn out onto waxed paper and allow to cool completely. *Brenda’s tip: Make in original small batches. Use fresh popped corn, still warm.